The following guest post is courtesy of avid reader and fan Cliff James. Whenever anyone thinks about the NBA, the greats of the modern era are indisputable: Michael Jordan, Kobe Bryant, and LeBron James, just to name a few. Since its inaugural season in 1946, much of the NBA’s personality and perception is defined by some of its best players. For much of the league’s time, African-American and Caucasian players have been its fabric. However, one player changed all of this. By becoming the league’s most prominent player of Chinese heritage, Yao Ming provided a different look to the league and in doing so, vastly increased the popularity of the sport. 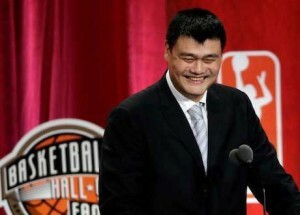 Yao’s achievements are highly regarded as he recently became a member of the Basketball Hall of Fame. Now he will have his jersey retired by the team where he spent his legendary NBA career, the Houston Rockets. After already achieving what is arguably the greatest basketball honor in becoming a member of the Basketball Hall of Fame, Yao’s next step in solidifying his basketball legacy will take place on February 3rd where his jersey (No. 11) will hang in the rafters of Toyota Center. Other all-time greats’ jerseys already memorialized in Houston Hakeem Olajuwon, Calvin Murphy, Clyde “the Glide” Drexler, and Moses Malone. Although Yao Ming never won an NBA championship or an NBA MVP award (he got close one season), his influence on the Rockets’ franchise is “up there” (pun intended) with the aforementioned legends. At 7’6” with almost a 10-foot wingspan, Yao entered the NBA as a player like no one had ever seen before. Scoring at the rim without even needing to jump most of the time, Yao’ shots were almost impossible to guard due to his height advantage. His talent didn’t go unnoticed as he made 8 All-Star teams, four different All-NBA teams, and the NBA All-Rookie first team during his rookie season. Despite his achievements, when looking back at Yao’s career, much of his immense potential was washed away with a series of injuries that eventually ended his career very early at the age of 31. Still, Yao Ming’s biggest achievements were not just his play on the court. ESPN’s Tracy McGrady summed it up best in an article he wrote about the time he spent playing with Yao Ming in the prime of his career. McGrady wrote how Yao led millions of people to the game of basketball in China simply because he had made it to the NBA. Overall, as we approach Yao’s jersey retirement, clearly the Houston Rockets were fortunate to have had such a game redefining player in Yao. That said, many fans forget there was a time early in Yao’s career when players (past and present) and the national media ridiculed him because they couldn’t believe a man who had never played collegiate basketball in this country — not even high school ball — could ever make it in the NBA. To make matters worse, when head coach Rudy Tomjanovich didn’t start him right away in his rookie season, primarily because Rudy himself didn’t know how good he was, Yao was unfairly called a bust and a failure. This angered many of his loyal supporters, especially those of Asian heritage, because Yao represented THEM. But when Houston’s starting center Kelvin Cato had to unexpectedly miss a few games early in the 2002-03 season because of the death of a parent, Rudy HAD to start Yao earlier than planned. The rest is history when Yao showed what he had in a breakout performance against the LA Lakers that changed everyone’s mind when he actually got a chance to play a meaningful number of minutes in a game. Although Yao spends most of his time in China now, the reception Yao gets when he returns to Toyota Center is always heartening to see, especially for Asians and Asian-Americans who believed in him when many skeptics did not. This entry was posted on Saturday, January 28th, 2017 at 10:21 am	and is filed under Retirement. You can follow any responses to this entry through the RSS 2.0 feed.